This cute full-color wooden paged book is adorable. It is all about dinosaurs having a barbecue dinner. The dinosaurs or "dinos" go grocery shopping together, cook together, set the table together, dine together, and finally go to sleep together. 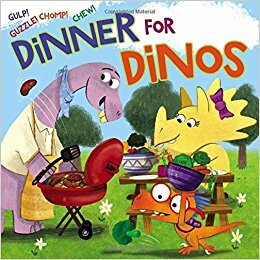 There is a section of the story where one dinosaur does not want to eat vegetables. This dino eats vegetables after another dino says how strong they make one become. That was adorable. There is diversity as the dinos are in all different shapes, sizes, and colors. There are boy dinos and girl dinos. One dino even has glasses. This is a great book to get kids excited about mealtime and cooperation with friends.